Secret Code rewrite: making grids in non-rectangular shapes. This is part of my rewrite of my secret code instructions. It won’t make sense if you don’t read the rest of the series! It has to do with using one of my encoding methods in a non-geometric shape. I’ve been working on rewriting my instructions for turning words into lace, and the example word I’ve been using is Peace. This chart and swatch will go into the instructions, but I also wanted to pull it out as a blog post of its own. Peace has been on my mind lately, and perhaps it’s been on yours, too. In the end, the “obvious chart” I was using for my other swatches turned out not to work so well for lace; this is often the way. (The lace turned into creepy, grinning faces, which is all very well and good if you want creepy, grinning faces. But that’s not very peaceful to my mind.) This is from the code grid I labeled “Method 4, 6 columns”. Just a small blog post this week. I’ve been rewriting my basic instructions for how to design secret patterns based on words. 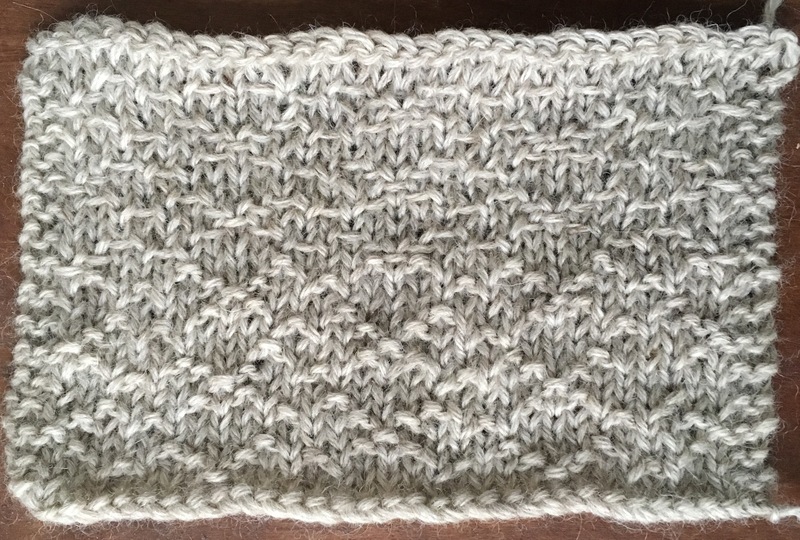 I knit these three swatches to go with the post about turning a code grid into a stitch pattern. While I love the lace designs I made from code grids, I also really like some of the possibilities with other kinds of stitch patterns. 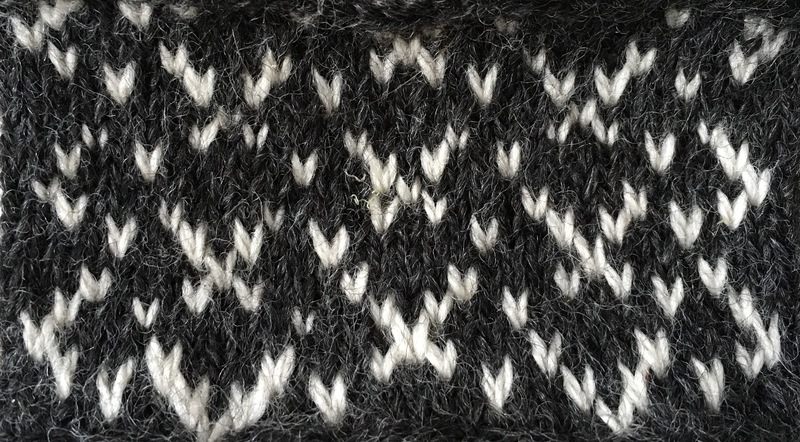 One shows the grid as colorwork, one turns it into a knit-purl pattern, and one shows it with slipped stitches with the yarn carried in front. This is two repeats of each Peace chart from side to side. I worked two and a half repeats of the knit purl chart vertically, stopping after row 3. I then started working the slipped stitch chart from row 4 (to continue the code pattern smoothly), and worked two and a half repeats of that chart. I am considering reknitting this one to be tidier. I should have made a plain border at the bottom; I think that would have helped me get the gauge right from the start. I think I might also do the pattern stitches on rows 1&4 with duplicate stitch. This is two repeats of the Peace grid horizontally, and two and a half vertically, ending after a row 3. I have some other swatches to knit for that post, too.